Tuesday, 27th Nov 2012. Palm oil futures recovered to higher ground yesterday spurred by positive price outlook from its rival products, Soya oil. Other news to follow. "- U.S. stocks finished mostly lower on Monday, with the S&P 500 Index ending a five-session winning streak, as lawmakers readied to debate the so-called fiscal cliff. Stock indexes came off session lows, with the Nasdaq Composite IndexCOMP +0.33% turning positive, after Bloomberg News reported the European Central Bank was receptive to the idea of giving up its profits on Greek debt. After a 109-point drop, the Dow Jones Industrial Average DJIA -0.33% fell 42.31 points, or 0.3%, to end at 12,967.37, with 23 of its 30 components in retreat. The S&P 500 SPX -0.20% declined 2.86 points, or 0.2%, at 1,406.29, with telecom and energy declining the most among its 10 major industry groups and utilities and technology faring best." "-Japanese stocks ended at a seven-month high Monday, further stretching a recent rally that has been inspired by a weakened yen, while Chinese and South Korean shares slipped on caution ahead of a Eurogroup meeting on financial aid for Greece. The Nikkei Stock Average JP:100000018 +1.80% , which had already risen in six of the seven sessions prior to Friday’s holiday, rose 0.2% in Tokyo to end at 9,388.94, a closing level it hasn’t seen since late April. Australia’s S&P/ASX 200 index AU:XJO +0.25% gained 0.3% and Taiwan’s TaiexXX:Y9999 +4.24% added 1.1%, building on Friday’s 3.1% surge on the local government’s pledge to support the local market after a dismal performance in the year to date. Chinese shares started the week on a muted note, with Hong Kong’s Hang Seng IndexHK:HSI +0.55% down 0.2% and the Shanghai Composite Index CN:000001 -0.49% losing 0.5%, while South Korea’s Kospi KR:SEU +0.47% slipped 0.2%." "-Oil futures settled lower Monday, pulling back after gains scored over the two previous sessions, as traders focused on developments surrounding Greece’s debt debacle and tensions in the Mideast region. Crude for January delivery CLF3 +0.33% shed 54 cents, or 0.6%, to settle at $87.74 a barrel on the New York Mercantile Exchange. Futures prices tallied a gain of 1.7% on Wednesday and Friday; the market was closed last Thursday for Thanksgiving." "-January Soybeans finished up 6 at 1424 3/4, 10 3/4 off the high and 8 up from the low. March Soybeans closed up 9 1/4 at 1412 1/4. This was 13 1/4 up from the low and 6 3/4 off the high. December Soymeal closed up 3.1 at 431.7. This was 3.8 up from the low and 2.0 off the high. December Soybean Oil finished up 0.23 at 49.27, 0.28 off the high and 0.41 up from the low. January soybeans traded slightly higher into the closing bell but well off the session highs that were put in this morning. Soybean meal ended the day in positive territory as did soy oil. Oil traded lower late in the session but was able recover near the end of the day. The USDA reported this morning that US exporters sold another 20,000 tonnes of soy oil to an unknown destination for the current marketing year. Soybean oil sales have surged in recent weeks which has triggered a wave of short covering to help support the entire soybean complex. Strong demand fundamentals helped to support the market early on but negative outside markets and worse than expected export data limited gains midday. Inspections for the week ending November 22nd were reported at 45.5 million bushels vs. 62 million last week which was below market expectations. Only 19.7 million bushels are needed to ship each week to reach this crop years USDA export estimate. The cumulative shipment pace is now 41% of the USDA estimate vs. the 5 year average of 30%. Traders are also monitoring the South American weather outlook. Heavy rainfall in areas of Argentina could mean an increase in soybean acreage due to delays in corn seeding. Central and Northern Brazil continue to see timely rainfall but southern Brazil is beginning to trend drier." Instead of going down due to weak demand, palm oil futures manage to rallied yesterday as Soya oil lend support. At closed, the benchmark Feb manage to went up about RM37 to 2,432, the day high and low was traded within 2,438~2,398. Volume was traded 17,648 lots. 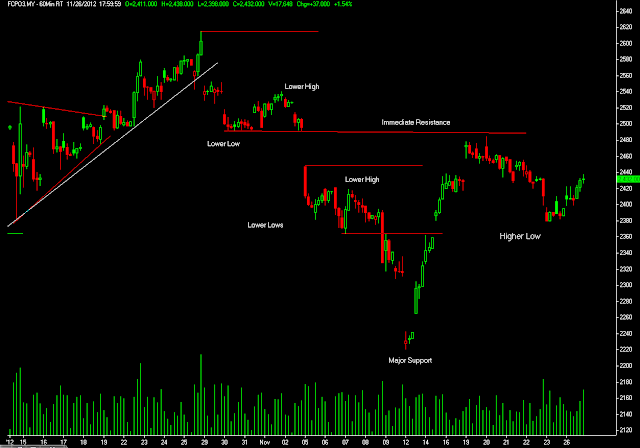 On surface, this recovering activities suggest that the market is poised to recover further judging from Bullish candle formation mentioned on previous post. The Bullish candle formation was known as higher low, which occur when Buyers overwhelmed exhausted Sellers. Higher low was also the early indication that prompt more strength for the market to recover as Sellers have loss most of their influences after the market manage to recover above second resistance level or higher yesterday. In other words, higher low or swing low can be only identified when the market rallied or recovered higher than first or second pivot resistance level (depends on the resistance area) from previous correction. Higher high will serve as a Bullish confirmation for the market to rally further. Apart from that, most stop losses for Long positions are placed a few points below this swing low level as market would reverse its role if it fall below any swing low level. 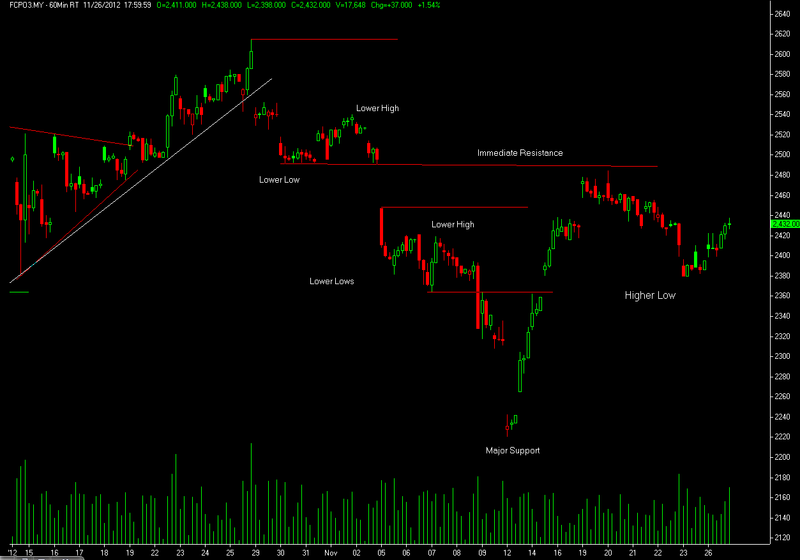 Bear in mind that candle formation such as higher low, higher high or lower high, lower low exist in most time frame. Market outlook for medium to long term time frame can be identified by looking on hourly chart up to daily chart, while shorter term or intraday market perspective can be gauge by looking at 15 minutes to 5 minutes time frame. For today, pivot support for the benchmark Feb is located at 2,382 while resistance is pegged at 2,462.